A lot has happened since I last wrote but I've been busy. I'll attempt to catch you up on what you don't know and what you may know but haven't heard. First off, Ball State lost and yesterday lost more - their coach Brady Hoke, who is taking the head coaching position at San Diego State University. Can't blame him for the San Diego vs. Muncie or the 4 year $3.5 million contract. It is finals week and for me the FINAL week of my undergraduate studies, can't believe it. I graduate Saturday, never would have thought it four years ago. Andi and I made a long trip to Shipshewana, Ind. 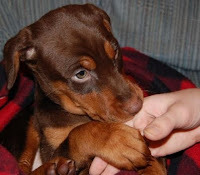 to pick up our new addition: a rambunctious 8-week-old Doberman puppy. It is a joint Christmas gift and she is really the cutest thing I could have imagined. We made the trip Monday, leaving at 4:40 a.m. and arriving at 8 a.m. I'll get more into her and her 'breeders' later. On the way home we stopped by Petsmart in Muncie and got her a collar, leesh, a Nylabone, and a bag of food. Right now she is sitting on my lap, dreaming with paws outstretched - charging up for another 20 minute burst of energy. Only 8 days till Christmas, do you have your shopping done? I don't.